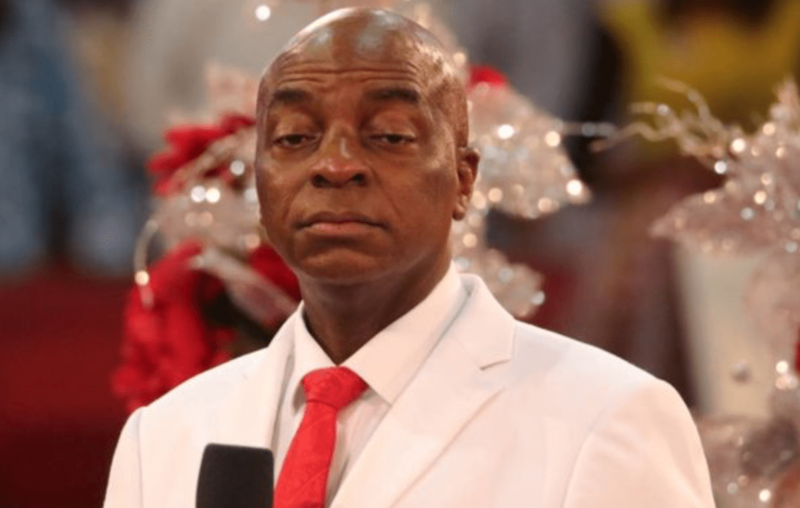 Oyedepo does not have to like Buhari – and it’s obvious that he doesn’t. Which is fine. But a man of his stature and learning ought to know better than to inflict on church members and propagate publicly a piece of monstrous fiction which, frankly, discredits him. It’s difficult to say which one was worse: the original falsehood or the misinterpretation and rebroadcast of its parody as gospel truth. The fugitive and self-acclaimed leader of the Indigenous People of Biafra, Nnamdi Kanu, is credited with inventing the fabulous tale that the real President Muhammadu Buhari died in London sometime in January or April, after a prolonged illness, and that the resident cabal in Aso Rock immediately replaced him with a body double, one Jubril al Sudaniya from Sudan. When the falsehood wasn’t spreading fast enough, Kanu shared pictures of the “former” right-handed Buhari, whose body double was now left-handed, and also highlighted facial differences, including those around the earlobes, to prove that the Buhari in Aso Rock today is not the Buhari that Nigerians voted for. That withering creative madness was the tipping point. Over 500,000 people have now viewed the body double video and perhaps the 500,001th viewer was Bishop David Oyedepo, leader of one of the largest Christian evangelical denominations in Nigeria. Oyedepo went further than just viewing the video. If there were any residual doubts in his mind about what he had seen and heard, they were settled by an article written by Professor Olatunji Dare in The Nation of November 27, entitled, “Buhari’s Double”, under a miscellany of short articles. Oyedepo read Dare’s article in full to a church congregation of tens of thousands of worshipers on Sunday with thousands more logged on. As he read it aloud, carefully emphasising the incredulous demand by the family of the fictitious Jubril of Sudaniya for a share of federal power in perpetuity, in addition to 50 per cent of the country’s oil revenue and the threat to spill the world’s best-kept sordid secret if the demands were not met, the faithful ughed! and aahed! in fits of amazement and subdued rage. Like a master puppeteer, Oyedepo maintained his cool. He gave the impression that reading newspapers was actually a waste of his time, but that he condescended to perform this task because the author, “one Dare”, had said the information was obtained “authoritatively.” Perhaps the bishop also thought that since the article said the U.K. authorities were already mediating in the matter, it merited his attention. But there were two problems with Oyedepo’s sermon on the Buhari Double, taken from the Book of Kanu the Fugitive. The first was that anyone with a measure of educated skepticism, who had looked even casually at the Kanu video, would have seen it for the creative fudge that it is. It is a monstrous piece of fiction, which even Kanu knows it is. As I watched the Oyedepo video again and again, it reminded me of how Donald Trump, then simply Celebrity Trump, retrieved from the gutter a despicable tale about Barack Obama not being an American and went ahead to launder and popularise it among a lunatic fringe called the birthers. The second problem was that the author of the piece, which Oyedepo used as the final authoritative evidence of the authenticity of the Buhari-turned-Jubril-al-Sudaniya story, is not just “one Dare,” as he said. Olatunji Dare is a renowned professor of mass communication and one of satire’s all-time best gifts to Nigeria. Was it possible that Oyedepo, pro-chancellor of two universities, did not genuinely know that Dare’s piece is a satire or was he too blinded by his dislike of Buhari that the satire not only played to his instincts but also became a convenient tool to incite his base against Buhari? As I watched the Oyedepo video again and again, it reminded me of how Donald Trump, then simply Celebrity Trump, retrieved from the gutter a despicable tale about Barack Obama not being an American and went ahead to launder and popularise it among a lunatic fringe called the birthers. The tale was later mainstreamed. Whoever heard of a “Barack Hussein” as anything other than a woebegone Muslim from a shithole country? Twenty-five per cent of adult Americans actually believed this tale and, like Trump, propagated it. Not even when Obama took the unprecedented step of publicly presenting his birth certificate did the doubters give him a break. There are other recent examples of tale-bearers remaking the world. Nigel Farage and Boris Johnson demonised immigrants as good-for-nothing spongers, saying that the National Health Service would be saving at least £350 million weekly if Britain left Europe. Life would be so glorious that every true Brit would once again feel the sun rising over the Empire. A good number of British people believed this fiction and voted Leave before finding out the morning after, that their leading politicians had sold them down the river. They didn’t know what they voted for. I admit that in this age of cynicism worsened by growing, unmet expectations and low-performing politicians, fiction is seductive. For example, it’s easier for politicians to play the ethnic card than it is for them to accept that poverty cuts across ethnic groups and to find common sense solutions; it’s easier for politicians to create a false universe of “we” and “them” and to stoke images of a siege mentality than it is for them to accept that heads or tails, they hardly lose. …nothing in the realm of rational thinking or even common sense, can encourage any serious-minded person, not just to think, but to believe that Nigeria is being ruled by a character from Nnamdi Kanu’s book of fiction. But fiction serves politicians well, because in politics as in religion, the masses have an increasing appetite for manufactured solutions, which celebrity politicians and rock star religious leaders have in good supply. Why think when someone else can think for you? So, when Oyedepo says that it would be irresponsible for Buhari not to respond to the tale that he is not Jubril al Sudaniya, for example, he is telling church members not to bother processing the fiction anymore. He, Oyedepo, with his education, enlightenment and exposure, believes the fiction – and that is enough. There’s a sense in which it might be argued that the official secrecy about the nature of Buhari’s illness could only have encouraged speculations about his health including, in fact, exaggerations about his death. But nothing in the realm of rational thinking or even common sense, can encourage any serious-minded person, not just to think, but to believe that Nigeria is being ruled by a character from Nnamdi Kanu’s book of fiction. Yet, belief is a powerful thing. Those who doubt it only need to ask the talebearers whether Buhari’s refuttal in Poland has done anything to clear the doubts. An egregious aspect of modern politics is manufacturing discontent. And belief is a vital ingredient. Those who accuse him of being a closet Buhari hater, citing his public appearance at the first Obasanjo-Atiku public meeting and the open-cheque lobby with a major Abuja-based Pentecostal pastor to prevent Godswill Akpabio from defecting to the All Progressives Congress, have Dare’s satire as more stick to beat him over the head. And by the way, has the bishop seen Dare’s postscript? Will he also read it in full to the congregation on Sunday? Azu Ishiekwene is the managing director/editor-in-chief of The Interview and member of the Board of the Paris-based Global Editors Network.